Please refer to our stock # 1132 when inquiring. This very well made bone carving of the legendary Chinese figure Xiang Yu 項 羽 (232 BC~202BC) is a late 19th century product. Xiang Yu is popularly known in Chinese as “Xi Chu Ba Wang” 西 楚 霸 王 which means “Conqueror of Western Chu”. For more information, please refer to the entry on Xiang Yu in Wikipedia. This statue is 9" high (with carved fitted wood base is 10" high), 3 3/4" wide and 3" in depth. 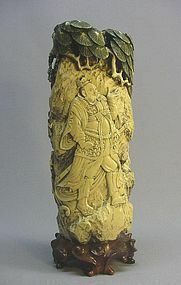 It depicts Xiang Yu standing under a pine tree. On the opposite side of the tree, a fierce dragon rises from the river water. It weighs 3.6 Lbs. There are cracks at both ends of the piece. Aside from the cracks, it is in good condition. More detailed photos are available.